Spondon is on the outskirts of Derby in midlands England. It was once a village but is now part of the greater Derby City conurbation. In New Zealand, the Maori have a word Turangawaewae — or the place of your ancestors. Spondon is the nearest I have to this as my ancestors have been in this village from the 1700s and still have a presence there today. It is thought that before Spondon, my ancestors came from Elvaston, which is a few miles away. My grandmother Kathleen Coxon was born in Spondon in 1906 and came to New Zealand with her husband and three children in 1947. I have visited Spondon many times and have walked the streets, visited the pubs and of course the church (St Werburghs) much as my ancestors have done. Please let me know if you have more to add for this page. Spondune 1086 (Domesday Book). Probably 'Hill where wood-chips or shingles are got'. OE spon + dun.. In the 13th and 14th centuries the village name was spelt Spandon. In the 18th century Spaindon and later still, Spoondon. It has been Spondon for a number of years. We have a family story about Spondon that my grandmother told us - it goes "Annie Maria Matilda Sophia Amelia Clara Jane, go and see what Albert is doing and tell him to stop it!" Apparently they used to hear it from their neighbour. 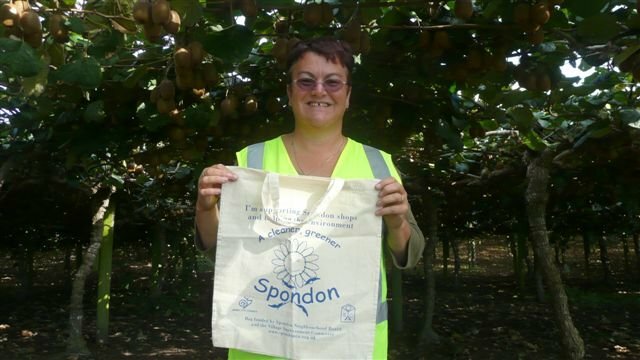 Thanks to Anne & Derek Hathaway of the Spondon Community Association for my Spondon Bag. WORLD CONNECT - at the 25 April 2010 there were 3878 entries on World Connect with the birth/marriage/death place as Spondon. Just enter Spondon and the surname in the respective boxes. Visit ROBIN ANTILL's web site for more on the Antill family of Spondon. ROWENA CADE - was born on 2nd August 1893 in Spondon, Derbyshire where her father owned a cotton mill. Her ancestors had lived thereabouts for 300 years. FAMILY GROUP SHEET - Hezekiah Clarke and Martha Cordon and Robert and Catherine Clarke. Visit my COXON page for more on the Coxon's of Spondon. Visit my World Connect page for the COXON family tree. MARRIAGES AT SPONDON, DERBYSHIRE 1653 - 1812 - from Phillimore Parish Registers. MEMORIES OF SPONDON - A short account of Spondon past. By Guy Brighouse. 1990. PARISH CHURCH OF ST WERBURGH, SPONDON, DERBY - By John R Hughes and S T Lusted. 1999. SPONDON, A HISTORY - By Susan Watson. 1989. SPONDON LIBERAL CLUB - The First Hundred Years. 1992. SPONDON HOUSE SCHOOL - The History of a Village School in the County of Derby (1662-c1964). By E J Kenedy c1964. AROUND SPONDON - By John R Hughes. 1997. 1855 POST OFFICE - Spondon. SPONDON ARCHIVES - Spondon Archives on the National Archives Web-site. Enter Spondon in the search box. SPONDON ONLINE - Information for the village of Spondon, Derby. SPONDON - A VILLAGE REMEMBERED - Lots of information on Spondon and its history. SPONDON AT GENUKI - GENUKI are Genealogical pages for United Kingdom and Ireland. ANCESTRAL VILLAGES - Spondon is included. CURIOUS FOX - Spondon - Entries from people researching Spondon families.